Ovente is the best electric kettle and home appliances online store in U.S. that produces high quality items that will benefit modern consumers due to company’s convenient and eco-friendly products. The online store is best-known for their stylish and A1 Electric kettles that create perfect water temperature for hot drinks like coffee and tea. Ovente’s bestselling electric kettles acquire exemplary functions that make them unique and desirable to consumers. Electric kettles from Ovente are highly reliable and convenient since it can boil water a lot faster than 85 percent of stovetop kettles out there. All materials are BPA-free. Thus, it doesn’t have any industrial chemical; these chemicals can be found in polycarbonate plastics and epoxy resins. It also includes removable filter to supply the freshest and healthiest water. Ovente electric kettles are highly durable, easy to clean and have a large water storage capacity that comes with 1.5, 1.7 and 1.8 Liters. 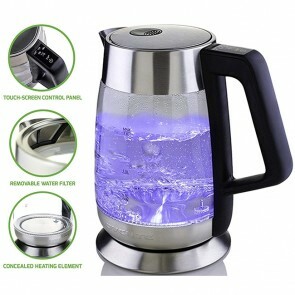 Stainless steel, BPA-free plastic and glass electric kettle containers for the body. Moreover, the kettle’s wire wraps into the base for cord-free serving and easy storage. These electric kettles have become very beneficial to consumers. Hence, consumers continue to patronize not only Ovente’s famous kettles but also their home appliances and beauty products. Ovente home appliances and kitchen online store in US continuous to follow the rules and regulations of Federal Trade Commission in order to pass FTC’s standards. FTC is the nation’s consumer agency that prevents fraud, deceptive and unfair business practices in the marketplace including online stores and other e-commerce businesses. Do not plug or operate the Electric kettle if it has a damaged cord. If the cord has been damaged or if the kettle has been malfunctioned, contact the service provider as soon as possible. Before operating the Electric Kettle, make sure to put it on a flat surface to prevent an accident. Electric Kettle is an electrical appliance, never forget to unplug from the main outlet after use. Allow the Electric Kettle to cool down before removing the water in it completely to avoid electric shock. Never immerse the Electric Kettle in water or any liquid as this may result to an accident. The inner part of the Electric Kettle can be washed with soap water. Make sure to rinse it thoroughly. Use a sponge or a soft, damp cloth to clean the outer part of the Electric kettle. Do not use abrasive soaps and cleansers when cleaning the Electric kettle. To avoid steam damage, keep the spout facing away from objects during operation. Keep the Electric kettle away from children. Supervision by adults is crucial if the kettle is being used by children. For more high-quality electric tea kettles, visit Ovente, best small kitchen appliances online store in U.S.